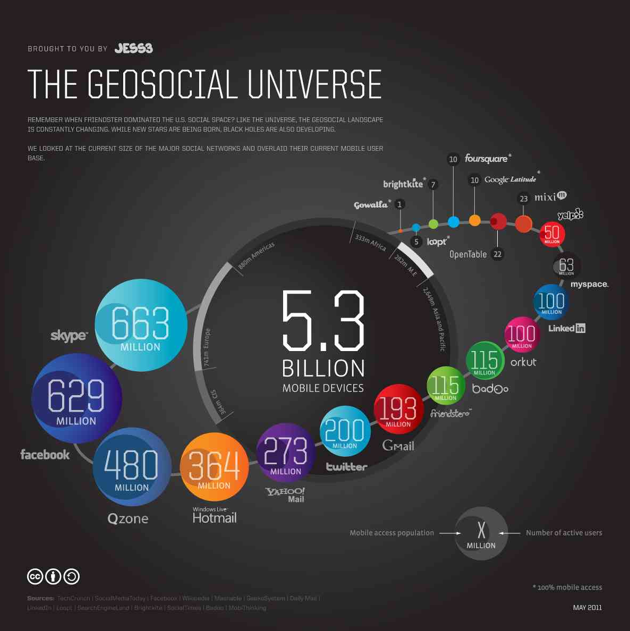 Thanks to Jesse Thomas of interactive design agency JESS3, we now have an updated look at the structure of the geosocial universe as it exists in anno domini 2011. It wasn’t so long ago that the International Astronomical Union booted Pluto out of the solar system or that MySpace was overtaking Yahoo! and Google as the most-visited site in the U.S. Well, a few rotations around the sun later, and the overall shape of the geosocial universe has changed dramatically. New stars have been born and others have been scattered out across the cold recesses of Internet space. Today, Myspace is sputtering, Skype is part of the Microsoft solar system, and LinkedIn is being traded publicly. The whacky flux continues. As you’ll see, Thomas’ infographic shows the current size of major social networks as well as the other well-known online services we use on a daily basis relative to their peers. It also overlays the present size of each company’s mobile user base. You’ll see Skype, Facebook, Twitter, Gmail, MySpace, LinkedIn, and more. You can also check out the agency’s infographic from last year to see the relative changes. 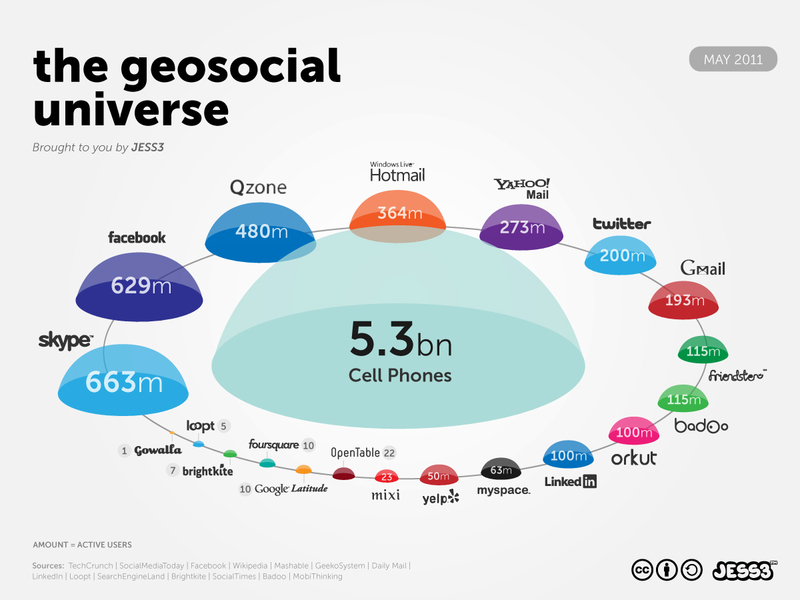 Notable differences include: The rise of Chinese Qzone and Twitter, the fall of Myspace, and the stasis of Friendster.